“Although it is generally accepted that humans cannot perceive sounds in the frequency range above 20 kHz, the question of whether the existence of such ‘inaudible’ high-frequency components may affect the acoustic perception of audible sounds remains unanswered. 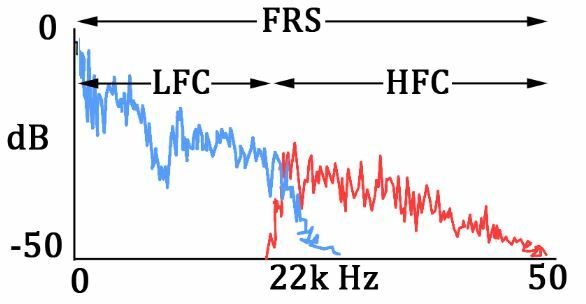 In this study, we used noninvasive physiological measurements of brain responses to provide evidence that sounds containing high-frequency components (HFCs) above the audible range significantly affect the brain activity of listeners. PD: “Yeah, and we could cover-up the body for some of the trials. Which leads us to today’s review. Please note – all images in this article were fabricated by the author from freely-available resources. No copyright holders were harmed. Behavioral measurements. Subjects also engaged in a behavioral task during each trial, which was to adjust the music loudness to a comfortable listening level (CLL) using an up-down switch to operate a motorized fader between the SACD player and a pre-amp. Stimulus. Capturing and playing hypersonic music is easy, especially if you own a proprietary high-speed one-bit coding signal processor with an A/D sampling frequency of 3.072 MHz like the Authentic Signal Disc ARHS9002 and Authentic Hypersonic Sound System (Yagi et al, 2002). As before, the signal was split into two bands, everything <22k and everything >22k (Fig. 1). Figure 1. Frequency/amplitude chart for hypothetical hypersonic music sample split at 22k Hz. FRS, full-range sound; LFC, low-frequency component (blue waveform); HFC, high-frequency component (red waveform). Conditions. 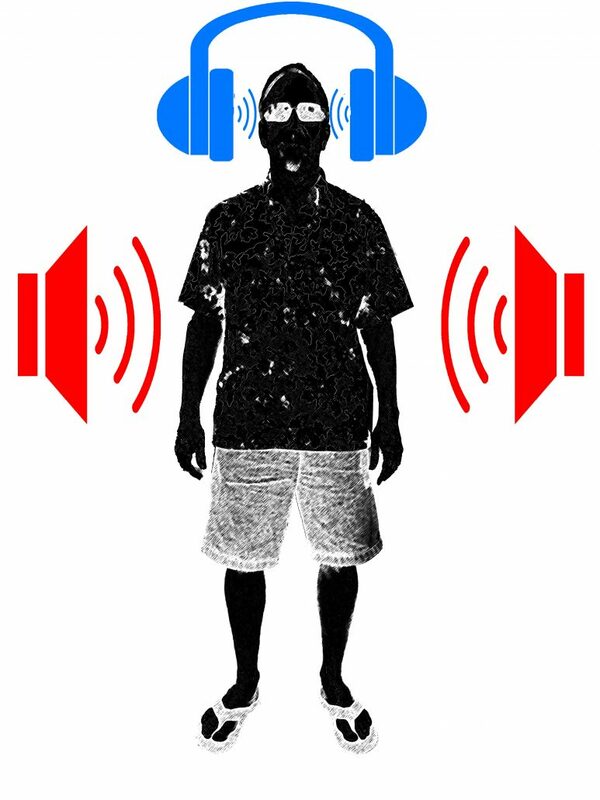 Now that they had the signal split, investigators could present three different stimuli (FRS, LFC and HFC) under three conditions (earphones, speakers with subject’s body exposed, speakers with body covered). The subsequent four sub-experiments chosen are explained in Table 1 and Figure 2. Table 1. Table of 3 stimuli and 3 presentation conditions. For each treatment, LFC and HFC were played either alone or together during different trials. Figure 2. Four treatments. (a) Both LFC and HFC presented through speakers; (b) Both LFC and HFC presented through earphones; (c) LFC presented through earphones, HFC presented through speakers; (d) LFC presented through earphones, HFC presented through speakers but with sound insulators preventing exposure of the subject’s head and body surface to HFC. Neuroimaging. Alpha-EEG was significantly greater for FRS (as compared to LFC alone) when HFC was played over speakers (Fig 3a and 3c). When the subjects’ bodies were covered, alpha-EEG power was significantly diminished (Fig. 3d). Behavioral. Measurements of subject behavior paralleled EEG results. Subjects usually adjusted loudness to significantly higher CLLs during FRS when HFC was played over speakers (Fig 3a and 3c). 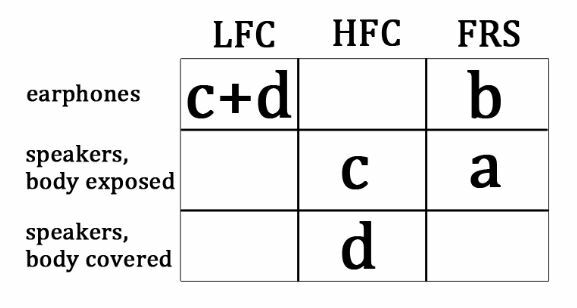 Conversely, subjects set CLLs at similar levels when during FRS when HFC was played through earphones. When a body surface was insulated from HFC coming through speakers, CLL was much lower. Figure 3. EEG results across four treatments (LFC and HFC played simultaneously). a) FRS over speakers, b) FRS through earphones, c) LFC-earphones/HFC-speakers, body exposed, d) LFC-earphones/HFC-speakers, body covered. Subject images scaled to reflect overall alpha-EEG power levels. The hypersonic effect is real, but it only works over speakers. And although this study shows that listeners tend to crank it up when hearing hypersonic music, subsequent research established that listeners could hear no qualitative difference between enhanced SACD and standard CD formats at normal listening levels. That finding might have dampened enthusiasm for marketing hi-res music to a general audience, but one can still purchase SACD players and find tons of great music on SACD. And anyway, as Duke Ellington tells us, “If it sounds good, it is good.” You like it? Play it. Next time, let’s talk about how your brain lives in the past. Oohashi, T., et al. (2000). Inaudible high-frequency sounds affect brain activity: hyper-sonic effect. J. Neurophysiol, 83:3548-3558. Yagi, R., et all. (2002) Auditory Display for Deep Brain Activation: Hypersonic Effect. In: The 8th International Conference on Auditory Display . (pp.248-253).